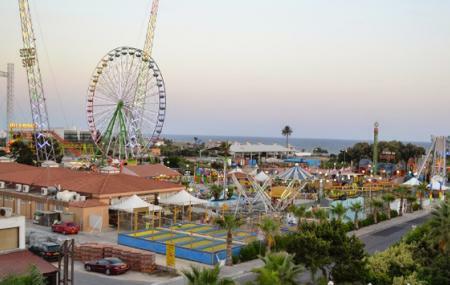 Find hotel near Parko Paliatso Fun Fair A ..
Parko Paliatso Fun Fair & Luna Park biggest Luna Park in Cyprus. The park stretches across 25000 square meters and is home to more than 25 exciting attractions. The Amuzement Park has a combination of rides suitable for both, kids and adults. The Luna Fun Fair can make for a perfect day out filled with entertainment with family and friends. Parking is easily available at the park. The park is home to 2 cafes. How popular is Parko Paliatso Fun Fair And Luna Park? People normally also visit Love Bridge while planning their trip to Parko Paliatso Fun Fair And Luna Park. Pretty good - kids had a nice 45 mins enjoying some rides. Funfair that opens until late (10 or 11pm!) good for those staying in Ayia Napa. Good for kids and adults. This is a great luna park in ayia napa. We just loved it. It offers great choice and there are a number of restaurants to eat at. One can easily pass hours of fun in this place. Looking nice. Was fun riding the horses.